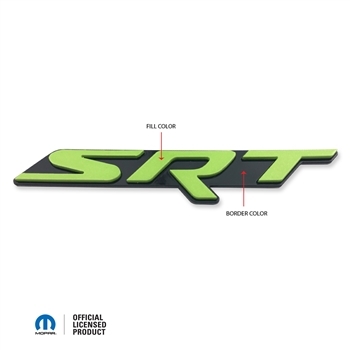 ABD Acrylic Custom Painted SRT Grille Emblem ABD Acrylic Custom Painted SRT Grille Emblem, ABD Acrylic Custom Painted SRT Grille Badge, Custom Painted SRT Emblem, Custom Painted SRT Badge, ABD-3129 SRT Emblem, Dodge, SRT Emblem, SRT Badge, Color Matched SRT Badge, Color Matched SRT Emblem, [ABD-3129 SRT Grille Emblem] - $49.95 : 3rd Strike Performance, Your Source for Late Model MOPAR Performance Parts and Accessories! Charger Acrylic SRT Front Grill Badge - Professionally color-matched painted to your color choice. No need to take apart your grill, this badge installs in seconds with 2 sided 3M automotive tape by simply sticking it right over the top of the original ABS plastic factory badge! Made in the U.S.A. by American Brother Designs and an Official Mopar Licensed product. Please enter your paint code you wish the lettering to be painted in the Text Box. Also please select the background color from White, Red Silver or Black. Or choose to have it custom painted to match or stand out on your car!